Abe Kemp began working at newspapers in San Francisco in 1907, when he was 14 years old, and spent the next 62 years primarily at The San Francisco Examiner where he covered his two passions, baseball and horse racing. Over the years he collected a number of stories of baseball on the West Coast. “’I’m going for a little air,’ yelled back Tub. Harry “Slim” Nelson was a mediocre left-handed pitcher and weak hitter who played a half a dozen years on the West Coast. Kemp told of witnessing him “hit a home run through the screen at Recreation Park” in San Francisco when Nelson was playing for the Oakland Oaks. McCarthy appears to have been correct. 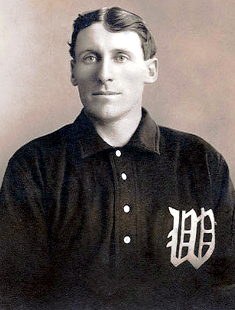 Van Haltren was criticized throughout his short time as a Coast League umpire, and became a West Coast scout for the Pittsburgh Pirates the following two seasons. Van Haltren made one more attempt as an umpire, joining the Northwestern League staff in 1912; he was no more successful, lasting only one season after incurring the season-long wrath of Seattle Siwashes owner Dan Dugdale who demanded Van Haltren not be retained for the 1913 season. “Eagan, suffering from the effects of a bad night (told) manager Hap Hogan he was suffering from an attack of ptomaine poisoning. ‘”What did you eat’ the artful and suspicious Hogan asked. “Most ballplayers can tell you to a fraction just what their batting average is any time you ask them. I can’t, though. In fact, I don’t know what my average was in any year that I was in the majors. “When I was with St. Louis and Boston I never bothered about my hitting. I tried to drive in runs when I got a chance, of course, but I wasn’t figuring on a base hit or my average. Spencer, in his first six major league seasons, from 1905-1909, and 1911 With the St. Louis Browns, Boston Red Sox and Philadelphia Phillies, hit just .214. In 1916, when there was “No more fooling for Tubby,” he hit .370 in 54 at-bats for the Tigers. Spencer apparently reverted to his old form after that, hitting .240 and .219 in his final two major league seasons. 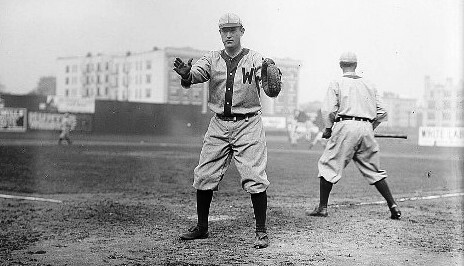 David Tilden Altizer did not begin playing professional baseball until 1902 when he was 25; he made his debut with the Washington Senators four years later. A member of the US Army, he was in China for the Boxer Rebellion and the Philippines during the Spanish-American War; he began playing baseball while in the service. The story said Reds manager Clark Griffith, unable to find Altizer, contacted “Nixey” Callahan, who was playing in Chicago’s City League, and asked him to put an ad in Chicago newspapers to find Altizer. Altizer appeared in three games for the Reds after he was located; he had six hits in 10 at bats, walked three times and scored three runs. Altizer went to sleep in a Pullman car on a train to California with “$1,475 in large bills” in his vest pocket and discovered when he awoke that the money was gone. It was never reported if the money was recovered of if the thief was caught. Altizer was batting with two strikes and runners on second and third. “The next strike came over and (umpire John) Sheridan called it a strike. The ball whizzed right through (Tubby) Spencer’s mitt and bounded up against the grandstand and shot off at an angle, while the chubby Spencer pursued it. Both of the Washington runners on the bases scored easily. After Altizer finished his Major League career with the Reds in 1911, he returned to Minneapolis where he played until 1918. He played and managed two more seasons with the Madison Grays in the South Dakota and Dakota Leagues, before retiring from baseball at age 44. He died in Pleasant Hill, Illinois in 1964 at age 87.